Because it’s getting warmer out, and because I can’t in good conscience give you another cookie recipe. Because I love olives, and hope you do, too. Because burgers made with turkey don’t have to taste like cardboard. Because the phrase tomato jam just sounds so cozy and delicious. Because the Katies and Perri and I ate them together, with pearl barley salad and wine. And wine. And wine. And wine. Just because. 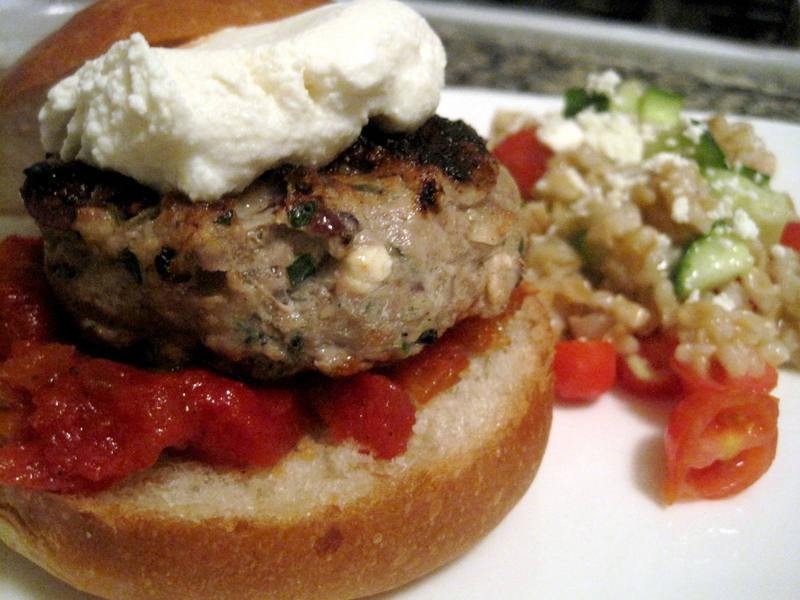 Turkey feta burgers with olives. And tomato jam. To make the tomato jam, heat the olive oil in a medium saucepan, and add the onion, cooking until soft and fragrant. Once the onions are translucent, add the garlic and cook for a minute or two, being careful not to burn the garlic. Add the tomatoes with their juice, the sugar, thyme, salt and pepper, and bring the mixture to a simmer. Simmer the mixture over medium-high heat, stirring occasionally, until most of the liquid has evaporated and you’re left with about 2 cups of tomato jam. Remove the jam from pot and let cool. To make burgers, place the ground turkey in a large bowl. Throw in the onion, feta, olives, garlic, parsley, salt and pepper, and mix gently, just until everything is combined. While mixing, try not to squeeze and mash up the turkey meat too much — overworking the meat will result in tough, dry burgers. Gently form the turkey mixture into six medium-sized patties, pushing your thumb in the center of each patty to form a small indent (burgers puff up in the center when cooked – making indents ensures a nice, flat patty, instead of a round burger that looks like a meatball). Heat up the grill (or, if you live in a tiny apartment like me), grill pan, to medium-high heat, and brush the grill (or grill pan) with olive oil. Grill the burgers until slightly charred and completely cooked through, about 5 minutes per side. Serve with fluffy rolls and tomato jam. And maybe a big scoop of ricotta, because it’s damn good and that’s the way I roll. Makes 6 burgers and about 2 cups of tomato jam. Oh Yum! I love olives and feta. This looks delicious.